I am one of millions who call themselves ‘Detroiters’ but who live away from the city. For us, the city of Detroit is about 15 miles away. A 25 minute drive and we’re there, though sometimes it feels like a million miles away. Increasingly, that type of separation is now happening within the city itself. 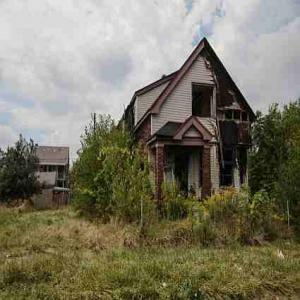 Detroit neighborhoods continue to suffer while the downtown area thrives. If you’re not from Detroit, you may have missed on a lot of great things happening in the Downtown area of Detroit. And a lot has been happening. Over the past fifteen years or so, the riverfront has and continues to be completely transformed. Many industrial sites used to line the river, but largely that is being transformed. There’s a miles long river walk that has been devloped for walking and biking, and parks, housing, and other river friendly development has largely unleashed the potential that many saw for decades, but never come true until now. Downtown Detroit was once home of dozens of old skyscrapers that had once been dazzling, but now sat completely empty and in various states of disrepair. In the early 2000’s, with a break at the end of the decade due to the great recession, interest started growing and some of these buildings started getting attention. Most had good bones and could be transformed. Dan Gilbert, the owner of Quicken Loans as well as the Cleveland Cavaliers basketball team, took a very big interest a few years ago, and started buying building after building and transforming them. Recently, he proclaimed that ‘there aren’t many buildings left’ to redevelop. Walking downtown a few weeks back, you could see the transformation underway as cranes are everywhere and buildings are getting new life. For both residential and office space, rents have been steadily increasing, practically doubling over the past few years alone. People who were here before the rapid rise aren’t happy, but many realize that this is a good thing as it shows that demand is up. In fact, rents are near a rather important tipping point. See, most of the development taking place right now also includes tax subsidies, either from the state or city or both. At this point, the subsidies are largely required for the developer to turn a profit. However, the rents are near the point where they could be self-sustaining, meaning tax subsidies would no longer be required. This is a huge step. This all sounds well and good, but the problem is that the downtown area only comprises a small area of Detroit. While there are other areas adjacent to downtown that are seeing some improvements (such as the areas around the Wayne State University campus, and the areas around some of the big hospitals in the area), the vast majority of Detroit remains in trouble. Neighborhoods in Detroit have taken the worst brunt of the long decline seen by the city, and unfortunately the decline here hasn’t slowed down much. This is bad news, because as much as it’s great to see things change and people move into the downtown and surrounding areas, the fact is that a majority of people and a majority of land that makes up the city are tied to the neighborhoods. It’s also where the poorest live and they are not seeing the signs of improvement that are being seen just a few miles away. Many of the neighborhoods that make up Detroit were built when Detroit was booming and growing and was one of the largest and most important cities in the United States. The problem: That all happened 70-80 years ago. The fact is, many of the houses are old and simply haven’t been able to stand up to the elements. Houses in Detroit are not worth much. While the media recently latched onto stories where homes could be had for $100, those were not anywhere near move-in ready. They basically had four walls, a roof, and hadn’t been set on fire. They were homes that nobody wanted. A home in Detroit can be purchased for a few thousand dollars, however it’s likely going to need improvement, but therein lies the problem. A house might only appraise for $5,000 but need $20,000 just to do things like replace the wiring, plumbing, and roof. No bank is going to offer a loan, so nobody moves in and the houses continue to deteriorate in condition. People have been leaving Detroit for decades. This means a need for a lot less homes than once existed. However, what usually happened with homes after they weren’t needed is they fell into disrepair and often were burned down. And there they sat for years, exacerbating the decline of the nearby houses and often creating a ripple effect. No matter how many homes were torn down, it seemed more blighted homes popped up. Over the past few years, federal money has actually accelerated this, and some neighborhoods are seeing a clear-out of blight, which is at least leveling things off. This is a start, though there’s a long way to go. This might be the biggest factor that needs to be corrected. The Detroit Public School district is a mess. Every year more buildings close because more people are leaving. For years, the district attempted to shore things up, often taking on new debt, hoping that the tide of people leaving would stop. It didn’t, so eventually the debt grew while revenues continued to shrink. It has led to the Detroit Public School district becoming one of the worst performing districts in the state country. It’s a mess and it’s now a cycle of doom that seemingly has no end in sight. About 10-15% of the state funding provided per student goes to service debt. It’s awful. The state is looking at ways to scrap the entire district. They would write a check for the debt, and let the district start over, debt free. This would be on scale with the city of Detroit bankruptcy a few years back, but while there is a lot of resistance (people are concerned over who would run the new district, and also what assurances could be made that the spiral wouldn’t just start all over again, not to mention people throughout the state who don’t want their tax dollars to erase this debt), it’s clear that something has to be done. It’s pretty sad and I hope things improve soon. In order to get to the city, you have to drive through some of the neighborhood areas. This can be a pretty sad drive. I spent a lot of time in Detroit when I was a kid. My grandparents lived there and I spent some weekends over at their house. Their neighborhood has held on but does have problems. I root for Detroit. It’s great to see downtown and the business districts turn around. But the transformation will not be complete until the neighborhoods follow. It has to start somewhere, and sometime. I hope it starts soon. Readers, have you heard any of the positive stories about Detroit? Or is the perception the same as it’s always been? We recently visited Detroit, as it’s in the running for where we may end up living next, and we enjoyed it. Awesome to hear that you enjoyed it and that it could be a residential destination for you. Stay in touch and let me know how the decision progresses and if I can help at all! When I think of Detroit, I think of the movie documentary Sugarman. It’s about Rodgriguez, a folk-singer from the early 70s. Rodriguez’s story is fantastic, and Detroit is a big part of it – so I think of Detroit fondly. I hope that the improvements that have happened in the downtown core have a ripple effect out to the neighbourhoods. I hope so too, but without a serious change in strategy, it’s going to remain a very tough hill to climb. Riverfront is simply amazing especially the part of Detroit Riverfront Conservancy! Yes, the Riverfront is truly awesome these days. Detroit is a really interesting city. At one time it was a bustling city of around 2 million, in the 1950’s I believe. Now, the city has well under 1 million people. I spent some time there on a work assignment early in my career about 15 years ago. The few months I spent there allowed me to explore the area quite a bit, and I talked to a lot of locals. 1) Reliance on one industry to a point of almost being insular. Here (Chicago), the economy is diverse with plenty of multinational corporations across industries. In Detroit, it’s heavily focused on the auto industry. It was to the point where I heard people saying things like “we’re a GM family”. I had zero understanding what that meant, until someone explained that it meant that much of the family worked for GM. They said it as if it was normal or an easy concept to understand, while to me the notion seemed bizarre that a family could affiliate with an employer in that way. 2) A lot of abandoned/burned out buildings. This can be said about parts of other cities, but nothing like what I saw in Detroit. While downtown had a ghost town feel, the neighborhoods seemed to be thinning out and almost returning to nature. Again, quite remarkable to see a city where people had flat out left to the point of leaving empty and even disintegrated neighborhoods. My understanding is that this has continued since then. With respect to downtown, it wasn’t seen as a destination for great shopping/restaurants etc but as a place to either work or avoid. 3) A lot of talk about “the way things used to be”. Much talk about things such as: how Detroit was “chic” in the 1920’s, this city had the best economy in the 1950’s, how going to a “Hudson’s” store downtown was once a great thing around Christmas, and so on. Not much buzz about the present or future, which is truly all that matters. Frankly, much of this was sad and I don’t think many of the people I spoke with even realized this. Living in the midst of decline is just something they were used to and part of their “normal”. However, I came away with an appreciation for just how vast the area really was. The city of Detroit itself is absolutely massive in terms of land area. To think that this area was once fully populated and a hub of employment is an impressive in terms of the history of it. Also, I was impressed with many of the suburbs of Detroit. As much as the city itself was in shocking disarray, the there were some really nice suburban areas. The types of communities where you can settle down and see yourself living for many years, as they have nice housing stock and good schools. There are some really nice communities there – which is something that many people nationally don’t know about the Detroit area. Overall, I see the Detroit area as being a tale of 2 separate “cities”. Many suburbs of Detroit are really nice with a very good quality of life – underrated I’d say. On the other hand the city and some other suburbs are in abysmal shape. Long-term, it will be interesting how the city reshapes itself as population continues to decline and neighborhoods are fully abandoned and razed. As an outsider, I optimistically think that the potential is there for the city proper to reinvent itself and become viable again – even if it takes decades to do so. Thanks for the great comment, Ray. I can tell you that in the last 15 years, the vibe of downtown has changed a tremendous amount. It’s now acknowledged that it used to be just what you said, a place to either work or leave, but it’s really evolved. Now there are lots of great restaurants (Washington Post recently did an article about how the downtown area is becoming one of the hippest spots for new dining trends in the country) and there’s a lot of retail, nightlife, and conversion of empty space into residential, office, etc. Granted, you wouldn’t still confuse it with Chicago or NYC, but nor would you recognize the vibe from even 10-15 years ago. I’ve heard that because rents are so cheap, the city is attracting a lot of artists and tech startups that can’t afford the Bay Area. I read a Nat Geo article not too long ago about how people with good jobs and money in savings are moving in and buying up the cheap property. Housing should always be a long-term investment, so if you buy it for $5k and put in $20k out of your savings, odds are you should get that money back in 30 years – obviously Detroit is the exception but if they can learn from the past, they won’t repeat the same mistakes in the future. Another way you can think of it is if you pull $25k out of savings on a house, you’ll get that money back in 1-2 years on rent alone depending on where you’re coming from. Less than a year if you rent exceeds $2k. Yes, they’re offering a lot of incentives for people that buy that cheaply to actually live or rent out the place versus just holding onto the property (and letting it decline) but it’s a slow go.